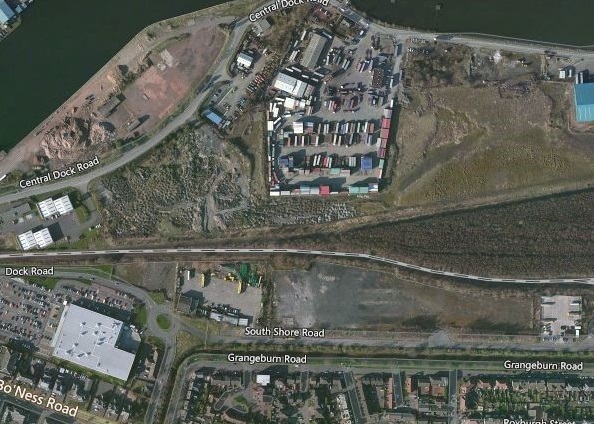 Grangemouth is the relative new town in Falkirk District, only coming to life with the opening of the eastern end of the Forth & Clyde Canal in the 1770s. But it was well situated therefore quickly profited with the completion of the canal due to the increase in trade from both the West Coast and from further abroad. Started by Lawrence Dundas [a majority shareholder in the canal, who clearly wished to maximise his profits] Grangemouth [or Sealock as it began life] was originally situated between the north bank of the canal and the River Carron, the large influx of workers for the docks meant the town quickly grew and soon expanded south onto the carse lands which is now the centre of the town. By the time of the football boom in Central Scotland had taken off Grangemouth felt secure enough in itself to join in, after a fashion. The first serious attempt to bring senior football to the town seems to be Zetland FC in June 1882 [largely at the hands of Richard Peddie, a former Falkirk FC forward [he lived in the port, but was actually from Sunderland [one of the many who moved to Grangemouth to work in the docks], he had a brother William [also ex-Falkirk but it not is known what, if any, part he had in Zetland FC]. Next to nothing is known of the players or the nature of Zetland FC [all reports in the press gave the barest of details] except that they played their home matches on the Public Park [Now Zetland Park] [Zetland Park was not named for the club, but for the above Lawrence Dundas, the Earl of Zetland, upon whose land Grangemouth was born, this is shown especially by the fact that the earlier village side of Laurieston [Lawrie's town] a mile or so to the north also played on a Zetland Park]. 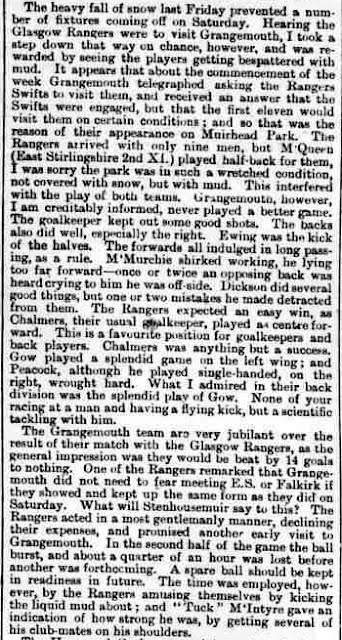 Zetland’s first match seems to have been against East Stirlingshire [themselves only founded in 1880/81] when a 1-1 draw was played at Grangemouth on the 12th of August 1882. Though the team played a fairly high level of opponents [Bo'ness, Grahamston Victoria, Stenhousemuir] that season it seems the main problem was that they rarely came away victorious in these encounters. The following season the footballing picture becomes very muddled down on the port, though this might be largely down to poor press coverage. 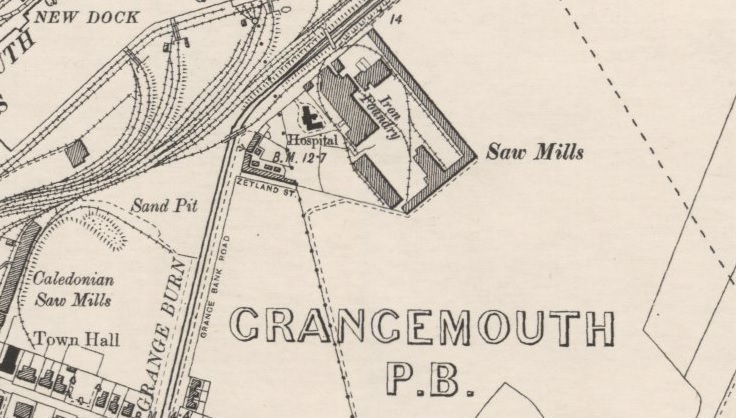 1883/84 is the first season that matches by a team named Grangemouth appear, playing home and away matches with Tayavalla [from Lime Wharf in Tamfourhill]. 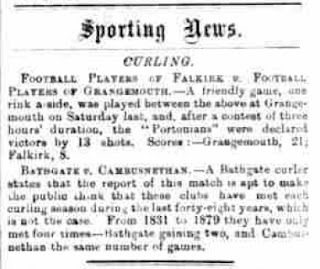 But in between these two matches a curiosity occurs, for on the 17th of November East Stirlingshire sent both their 1st & 2nd teams to play in Grangemouth. The 2nd XI defeating ’Zetland’ by a goal, whilst the 1st XI played out a goalless draw with ‘Britannia’ on the same day. Both matches on the public park. This leaves many questions unanswered. 1) was East Stirlingshire playing two distinct clubs that day? 2) Was Britannia the same club as the ‘new’ Grangemouth? 3) Had Zetland changed name to Grangemouth/Britannia [with their 2nd team styling themselves 'Zetland' in the same way that Falkirk often fielded a 'Brockville XI']? Were there, in fact, three teams now in the port? Sadly lack of any concrete info means we will probably never know. What is certain is that none of the names, Britannia, Grangemouth or Zetland were amongst the entrants to the inaugural Stirlingshire Cup that season, and until the end of the season there is no more mention of football in the town, but that final mention is interesting because for once the report actually mentioned the players and gave a line-up, the match was Britannia against Grahamston 2nd XI in Falkirk on the 17th of May 1884. 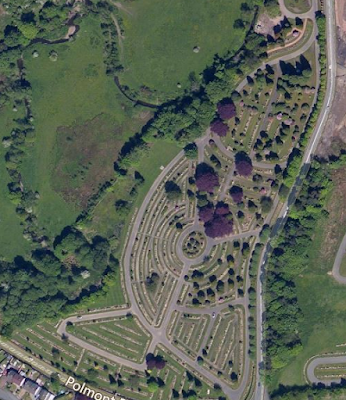 Britannia – Muir; Egan & Syme; Johnston & Anderson; Dixon & Robertson, Drysdale & Proudfoot, McDunachie & Latters. Albert Dickson! [from Dublin], went on to play for Falkirk and Hodge Drysdale for Grahamston. The next seasons 1884/85 & 1885/86 senior football completely disappears from the radar in Grangemouth, only a couple of references to the [new?] 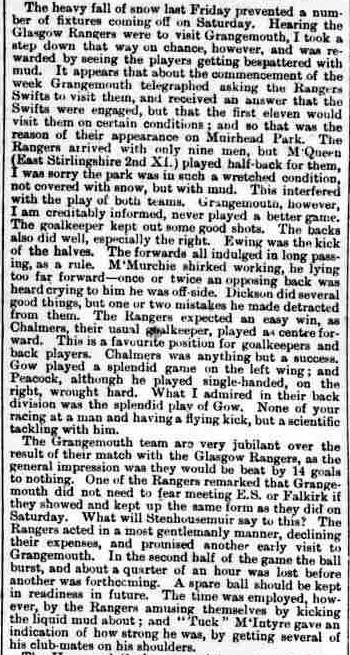 junior club Grangemouth Thistle appear in the press, and most games were against Linlithgowshire junior teams. Followed with a single mention of St Mirren, seemingly a junior team from the town later on. 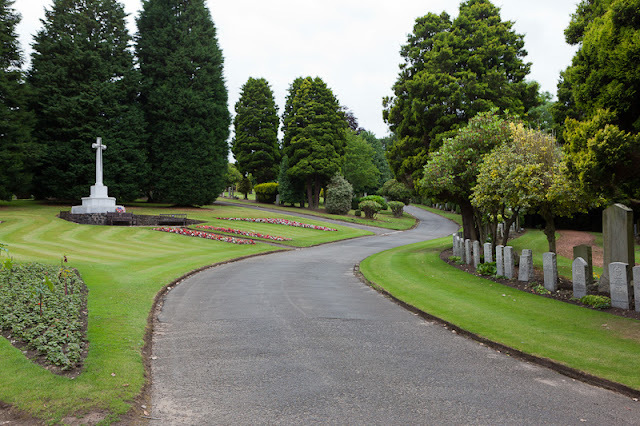 Though never stated, the club most probably started playing on the same Zetland Public Park, but soon moved to Muirhead Park [on the grounds of Muirhead sawmills, currently part of the BP complex] before moving to their more permanent home of Caledonian Park [behind the Grangemouth Town Hall, on the grounds of the Caledonian sawmill [or where ASDA is now ], the rest, as they say, was history, until the Scottish League killed off Senior Football in all but the largest towns.